Radwan Ghazi Moumneh let us know right away that while this was a celebration of music, it was taking place in the context of a tragedy. All performers at the Rialto Theatre tonight would be donating their pay to charity Hand in Hand for Syria. But in the uncharacteristic few words to the crowd, he didn't get political — simply asking the crowd to show some humanity for the people suffering from war by giving their own donation on the way out. In a suit jacket and shades, often the only thing lighting the Rialto during his audiovisual Jerusalem in My Heart performance were the projections. Radwan was a silhouette against images like children running on sand, before spinning into a kind of psychedelia. He brought out a band briefly, all seated and adding a pounding rhythm to his low drones and buzuq playing. He ended the solo portion singing off mic, and you could hear a pin drop at the Rialto. Even though this was the release show for the latest Jerusalem in My Heart solo record If He Dies, If If If If If If, it was the combined act with Suuns that was headlining. The collaborative record has been out for months, this was the first time most hometown fans would see it done live. So it wasn't a surprise that they played Suuns and Jerusalem in My Heart in its entirety, in just a slightly different order. The record evolved from unscripted jamming two years ago, the result is dense and often sprawling, combing Suuns' love of lurking, murky rhythms and Radwan's melodic depth and multimedia — and their shared love of low, loud synthesized bass. The only exception is "Leyla", feeling more like a solo track from Ben Shemie and his guitar, with the band adding colour around him. On the other end of the spectrum is "3attam Babey", the gargantuan album-closer — nine minutes on the record — possibly longer live. It's layered, and heavy and makes you want to dance. In that sense it sounded like Suuns at their best, except with an added break of singing in Arabic. 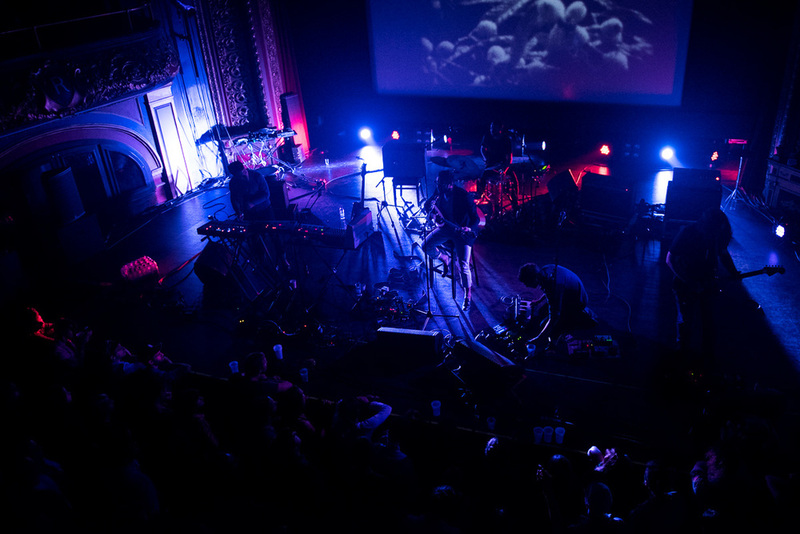 But it was "Gazelles in Flight" that closed their set at the Rialto with Shemie and Liam O'Neil standing around a hi-hat, tapping out a steady stream of hits, elevating the song into a trance-like state as the synthesizers and Radwan's vocoded singing grew around them. It was a hypnotic experience. A packed, sweaty l'Esco felt like FET.NAT's natural habitat. The venue was a temporary home for the Outaouais, with the Hull band sharing the stage with fellow Gatineau-ites The Hilotrons and Boyhood from Ottawa. Waving absurd signs like "The Earth is Flat!" and "Poule mange poule" they worked through their set in fits and spurts, the sax player never taking a moment to breathe. Even between songs he kept up his manic playing. Part prog, part comedy, the nutso FET.NAT show might be the best way to get out of the Suuns+JIMH hypnosis. Stopping mid-song to have a ridiculous conversation, and getting the crowd to chant "Eh! Toé! ", the band clearly doesn't take themselves too seriously, and that's what makes it work. The final subtleties of that Rialto show were hammered out of my head by Cheap Wig at Brasserie Beaubien. They were headlining the Craft Singles showcase, with 15 minutes of short, fast punk rock. Enough time to finish a big bottle of 50 and do some headbanging.